In the evening on Friday, the tenth of January, the Częstochowa Icon came to the school of Colegio del Rincon de Nuestra Senora in Prado, in the town of San Cugat del Valles which has 80 thousand inhabitants. It received a warm welcome from the students who prayed before Her class after class all day. At 5.30 PM the Icon in Her Life Mobil went to visit the Tibidabo Mountain, where you can see an outstanding and picturesque view of Barcelona. On the top there is the National Expiatory Temple of the Sacred Heart of Jesus. In 1886 St John Bosco came to Barcelona in order to open one of his schools here. During his journey he had a prophetic dream. He asked in it where he should establish his next work. He heard an answer: “tibi dabo, tibi dabo”, which means “I will give you, I will give you”. On the last day of his stay in Barcelona in the basilica de Nuestra Senora de la Merced, which houses the image of Our Gracious Lady, twelve oligarchs of this city handed St John Bosco a foundation document which made him the owner of a plot of land on Tibidabo Mountain. The donors wished the work to be the act of expiation for the sins of the city. So it was at the top of this mountain that St John Bosco founded a church as expiatory work for the Most Sacred Heart of Jesus. The church has a big statue of Christ on the top. The statue is looking at the city. The name Tibidabo comes from the vast landscape seen from the mountain and refers to the Biblical scene of the tempting of Jesus in a desert, when satan took Him to a high place and offered everything He could notice, demanding “only” homage for that. Jesus Christ refused right away. 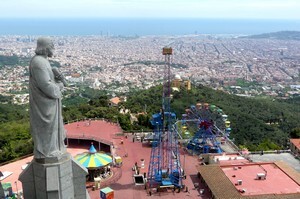 Today on the Tibidabo Mountain beside the church there is an Amusement Park which includes a lot of attractions for children. They started to build it as early as 1889. Numerous tourists and families with children come here. Next the Mother of God in Her Częstochowa Icon went again to the Church of the Miraculous Medal in Barcelona, where, after the Holy Mass, She was carried to the underground church to the pro-lifers meeting deliberately organised at the Pro-Life Museum, which is run by a pro-life organisation CIDEVIDA placed at the parish. It was late at night of January 11, when after the evening prayers at the Church of the Miraculous Medal, the Mother of God went to the contemplative convent of the Carmelite Sisters from Igualada-Jorba. She arrived in the convent as late as 11.PM. After the Icon had been carried into the convent chapel there was an exposition of the Most Blessed Sacrament. The adoration lasted throughout the night. On Saturday, January 12, in the morning at 8AM a Holy Eucharist was celebrated, and at 11AM the Icon left for Saragossa.